Quick Study: Mikhail Shishkin may be best known for becoming the first writer to win all three of Russia’s major book awards—the Russian Booker, Big Book Award, and National Bestseller Award—thanks to complex, allusive novels about universal and emotional themes. The Shishkin File: Mikhail Shishkin’s literary debut came with the 1993 publication of the short story “Calligraphy Lesson” in the Russian “thick journal” Znamia; the journal published his first novel, One Night Befalls Us All, later in 1993. Shishkin’s novel The Taking of Ishmael was serialized in two issues of Znamia in 1999 then went on to win the Russian Booker Prize in 2000. 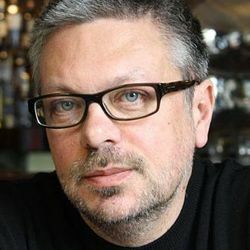 Shishkin has continued to rack up awards, winning the National Bestseller in 2005 for Maidenhair and the 2011 Big Book Award for Letter-Book, which won Big Book’s top jury and reader awards. Psssst………: Shishkin’s jobs have included working as an interpreter for refugees in Switzerland. Shishkin’s Places: Moscow, where Shishkin was born and attended the Moscow State Pedagogical Institute. Zurich, Switzerland. Shishkin Recommends: Shishkin has mentioned influences and favorite writers including Heinrich von Kliest, Alexander Goldstein, Anton Chekhov, Leo Tolstoy, and Ivan Bunin. Translating Mikhail Shishkin: “Translating Shishkin means maintaining his virtuosic tension between complex detail and deeply felt emotion.” Marian Schwartz, as quoted on Words Without Borders. An excerpt from Calligraphy Lesson (Урок каллиграфии), Shishkin’s debut work, appeared on Words Without Borders, also translated by Marian Schwartz, and "The Half-Belt Overcoat," translated by Leo Shtutin, is in the 2012 Read Russia! anthology.